The information contained here was obtained by a combination of measurements and printed data and is subject to error. It should be considered preliminary and subject to change. Incorrect voltage or polarity can damage a calculator. If you find any errors, please contact Dave Hicks. Chargers are either 120V or 120/240V switchable unless otherwise noted. Information on 240V only chargers is needed! This information is supplied without representation or warranty of any kind. The Museum of HP Calculators does not assume any responsibility and shall have no liability, consequential or otherwise, of any kind arising from the use of this information. Please be careful cutting old packs apart and working with leaking batteries. Warning! Most models can be damaged if run from the charger without good batteries installed. Only the manuals for the HP 35 and 45 models say that it's OK to run without batteries, but many collectors feel that even those should have batteries installed for maximum protection and long life. Don't completely discharge packs every time to avoid "memory effect". Discharging a pack too far can cause the stronger cell(s) to charge the weakest cell in the opposite direction. This is called reverse charging and will lead to a very early death of the pack. However, through normal use, it's fine to occasionally run the calculator to the point where it indicates a low battery. NiCds that are weak due to overcharging can sometimes be rejuvenated by a full charge/deep discharge cycle. Unfortunately, the only way to assure that reverse charging doesn't occur is to discharge each cell separately. NiCds are easily damaged by heat so if you need to solder leads to them, use batteries manufactured with solder tabs. Be quick with the soldering iron and wear eye protection in case of a rupture. Even with proper use, NiCds do eventually wear out. Some apparent battery problems are really caused by surface corrosion on battery or charger contacts. A knife or fine sand paper can sometimes work wonders. Be careful not to sand/scrape through the plating! Work very gently. Some people have replaced NiCds with standard alkaline batteries. These may work but are not exactly the right voltage so there could be damage on old calculators. If you attempt this, make sure to get the polarity correct. Do not attempt to charge alkaline cells. Some people have replaced NiCds with NiMH cells, however the older HP charging systems were not designed for NiMH cells so you need to use a different charger or modify the HP charger. This is not recommended unless you are sure of what you are doing. Replacing standard NiCds AAs with higher capacity newer NiCD versions usually works. Please also see Katie Wasserman's article. The Classic battery pack consists of 3 tabbed AA NiCd batteries providing 3.75 volts. The battery case can be carefully cut along the seam and glued closed to install fresh batteries. Output 3.6-4.7 V DC @ 150-190MA calculator, and 4.2 V DC @ 50-60 MA battery charger. (Exact specs vary slightly with charger model but chargers are interchangeable.) A complete recharge takes 14 hours with the calculator on or off. The batteries are low when extra decimal points are displayed. 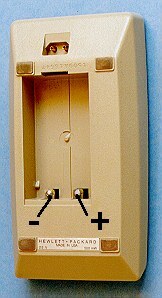 Looking at the plug, the center terminal is marked negative. The left terminal is marked + and charges the batteries and the right unmarked terminal (also positive) supplies operating power. (The battery charger circuit is current limited and will typically read much higher than 4.2 V without a load.) 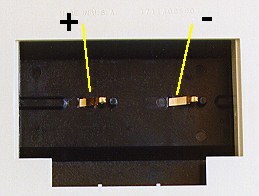 When the power plug is removed, a spring connects the left and right terminals allowing the batteries to power the calculator. Sometimes, classic batteries seem to be dead because surface corrosion has built up in the springy piece that connects two of the charging posts when the charger cable is removed. Try cleaning them with a pocketknife or fine sandpaper but be very gentle and careful so you don't sand/scrape through the plating. They are NiMH, exactly the right size to fit in an HP 35, 65, etc. and even better, they come with nice Red and Black wires about 4 inches long. Just connect the wires! This battery, once charged, seems to run forever & not lose power." The Woodstock battery pack consists of 2 AA NiCd batteries providing 2.5 volts. Because the battery pack is also the battery door, it is difficult to produce a suitable replacement. The easiest path is to find an old pack, cut through the center plastic strip between the two batteries and slide new cells in. (Cutting at the terminal end seems to work best.) Alternately, you may want to separate the two halves of the pack at the seam by prying with a knife. This may be a little more work but the pack can be reassembled with less signs of tampering. Many 20 series calculators have been damaged by replacing batteries with the polarity reversed so be careful. Output 10 V AC, 1.8 VA Max. A complete recharge takes 17 hours with the calculator on or 6-10 with the calculator off. The batteries are low when extra decimal points are displayed or the decimal flashes. The Sting battery pack consists of 4 AA NiCd batteries providing 5 volts. The polarity keying is somewhat subtle. 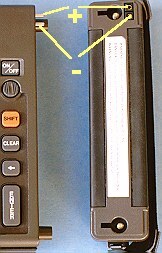 The pack can only be installed such that the terminal holes are near the top side (with the calculator held face down.) There appear to be 4 terminals but only the outer terminals provide power. The center posts in the battery compartment serve to label the outer posts! 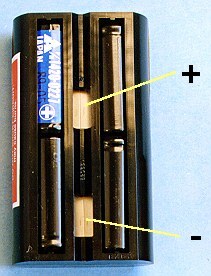 The key depressions in the top of the pack allow the door to be installed after the battery is inserted. Output 8 V AC, 3 VA max. A complete recharge takes 17 hours with the calculator on or 6-9 with the calculator off. The batteries are low when extra decimal points are displayed or the decimal flashes. The Coconuts came with a holder for 4 N size alkaline batteries. The rechargeable pack was an option. The SANYO N-75P cells in the rechargeable pack are have been discontinued and are very difficult to find. The closest equivalent is the 1/3AAA NiCDs such as the Sanyo 1/3AAA-50WT. These have also been discontinued but may be easier to find. Some possible sources: http://www.tnrtechnical.com, http://www.dantona.com, and http://nicdlady.com. 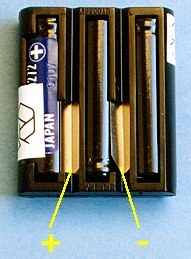 NiMH cells in this size are still available, however the original HP charging circuit was NOT designed to charge NiMH cells. You may be able to use them with a different or modified charging system. The cells are welded and there is little room for any other approach. Professional help such as Batteries Plus is inexpensive and recommended. The easiest way to revive an old HP-41C is to buy N cells for the standard holder. Output 8 V AC, 3 VA max. The Spice battery pack consists of 2 AA NiCd batteries providing 2.5 volts. The keying on this pack is subtle but important. The area under the recycle logo is flat, but on the other side of the pack, there is no flat bar between the batteries. 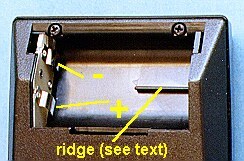 A ridge in the battery compartment assures that the pack is installed correctly. Radio Shack "Replace-A-Cell" (cat. no. 23-191) batteries are said to work well as replacements. Output 1.8 VA max, 10 V AC. Do not use A models on continuous memory calculators. A complete recharge takes 17 hours with the calculator on or 5-9 with the calculator off. The batteries are low when a raised point is displayed on the far left of the display. The Topcat battery pack consists of 4 tabbed sub-C NiCd batteries providing 5 volts. Output 8 V AC, 3 VA max. A complete recharge takes 17 hours with the calculator on or 7-10 with the calculator off. The batteries are low when a red lamp in the upper left of the display illuminates. Same pack as the classics. 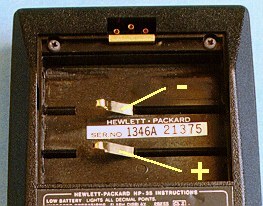 The 94 battery pack is a sealed unit which screws onto the side of the computer and also serves as a handle. It provides 5 volts via 4 2/3C NiCds. 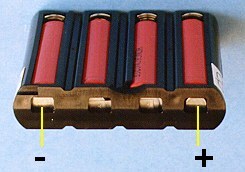 In the picture below, the battery pack has been rotated 90 degrees to show the terminals. The two large spots at the top and bottom of the pack are screws. It is labeled "Output 6.4 V DC 400 mA". (The diagram is looking at the end of the plug.) The rated voltage is found across pins 1 and 2. Pin 3 is unused.